Of all the casinos in central London, the one that carries in its name worldwide brand recognition is The Ritz. A byword for class, for an experience above and beyond what consumers can usually expect, the Ritz Club casino is based in the famous hotel’s basement floor (which used to be the ballroom. The Ritz reputation is maintained with superb service, an outstanding restaurant and bar, and it is certainly one of the world’s most beautiful casinos. 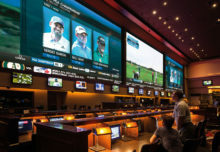 But having the name is just part of the battle, as any casino battling for a cut of the high rollers market must adapt as the world’s economy changes. Chief Executive Roger Marris is striving to ensure the casino respects its history, while looking boldly toward the future. 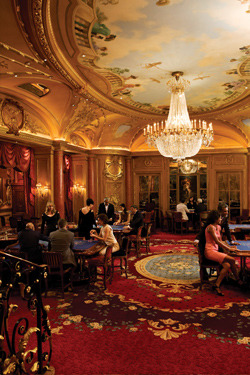 Casino International: Where were you before being appointed Chief Executive of The Ritz Club? Roger Marris: This is my second innings at The Ritz, but as Chief Executive I have been here since November 2011; previously I ran the online gaming business for The Ritz, which was sold in 2007. My background in gaming is with Harrah’s, WSOP and Littlewoods, on the gaming side of the business. 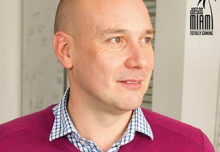 Prior to coming back to the Ritz I was working for a FTSE 250 business, not at all connected to gaming but it was a role that took advantage of my strategic, operational and management skills in a multi-channel business. RM: What that time outside the industry; including my experience of working in China, gave me was a window in to how another business runs. So looking at processes, management, introduction of new channels and much more. I think the skill sets I learned outside of gaming will help me in this role because the landscape is changing, we are evolving and we have to be on our toes. We need to adapt to the international audience, the international operators, we are a family-owned single-destination business, which has its own challenges and opportunities. We can’t sit back on our laurels, there’s a lot more we can do. CI: What changes are you bringing to The Ritz? RM: We’re putting so many initiatives together, new marketing, a different pace into the business without changing the fabric of the place and the great people we have here, in these beautiful surroundings. We’re an international business that happens to be in London; our customers are international, we’re not dependent on the London market for our business. It’s a much more competitive environment where we’re being exposed to marketing practices, new initiatives, that the international operators – Genting, Crown et al – are bringing to the high end market, that we’ve not seen before. It’s about recruiting and looking after high rollers. It’s important that we embrace that, that we don’t get left out but that we do it with our Ritz hat on. Change is difficult for any business, but I think the high end is getting smaller as the industry is seeing some shrinkage. The players are still out there but they’re in new markets; the Far East is an area that historically we have not spent a lot of time looking at, but it is somewhere we will be looking at in future. We have to be ready to receive the Far Eastern audience. CI: How do you find new members then – or how do they find you? RM: We don’t have a high turnover of members – we’re not a business where a KPI would be that we add 10,000 new members a year. We work very well on membership referrals, so our members bring new members in. We have agents that bring members in, and we have customer reps, or CRs, who travel and find suitable members, or make new contacts. We’ve also been putting on new events; Thursday nights we host live jazz, we have poker evenings with tournaments, and that’s been great for bringing in new members. We’re looking at adding some backgammon to the schedule too. With a bit of marketing nous, we maintain a good stream of members. But you have to strike a delicate balance with members who are happy with what we are and what we’ve always done, and events and things that appeal to new members, or different types of people. CI: What changes have you already implemented, other than increasing promotional activity? RM: We’re introducing a new gaming platform later this year, and we’ve moved staff around a little bit. It’s that we’ve restructured our approach from being simply very focused operationally to having both operations and marketing focus, so we’ve got more marketing people on board. We’ve increased the footfall as a result. Internally there is a lot more reporting and we’re now keeping a sharper eye on reporting and data. I’ve always been a big fan of data, and using it to help make decisions. We’ve maybe not used it so much historically, though we have always done it. Finally, we’re using risk management, understanding through modeling the risks of the business. What effect does walk-in chips or marketing chips have on the business, for example? At the high end, that becomes an even bigger risk potentially, so what sort of turnover or drop I need from players from a planning point of view in order to make that decision. CI: Do you think of The Ritz as being a very British experience or as an international experience? RM: If you come to the hotel, it’s quite a British experience. What you need to get right with that kind of experience, is giving a modern British experience and not something that’s twee and dated. I think the Ritz Hotel maintains the perfect balance. We use our heritage and our beautiful surroundings for a very British experience, but combine that with The Ritz Club’s multilingual staff, our slightly more relaxed dress code compared to the hotel, the games we offer, we move toward being more of an international operation.